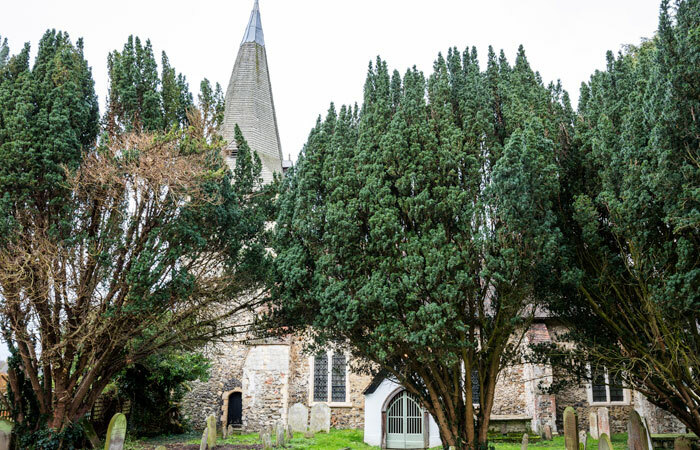 The small and welcoming church of St Mary’s in Fordwich is just 3 miles from Canterbury and has been offering rest to weary pilgrims for centuries, sitting on the ancient Way of St Augustine. Slap-bang on the River Great Stour, the truly teeny-tiny town of Fordwich still has the feel of a quaint town of centuries past, with its totally titchy Town Hall, virtually untouched since it was built in 1544. You can mess about on the river, or make like a true pilgrim and avail yourself of the victuals and ale provided by England’s smallest town’s two pubs. 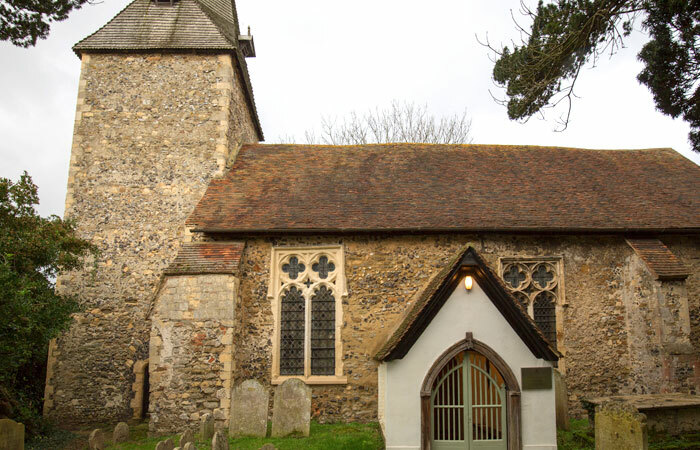 St Mary the Virgin in Fordwich, Kent, The Drove, Fordwich, Canterbury, Kent, CT2 0DE. 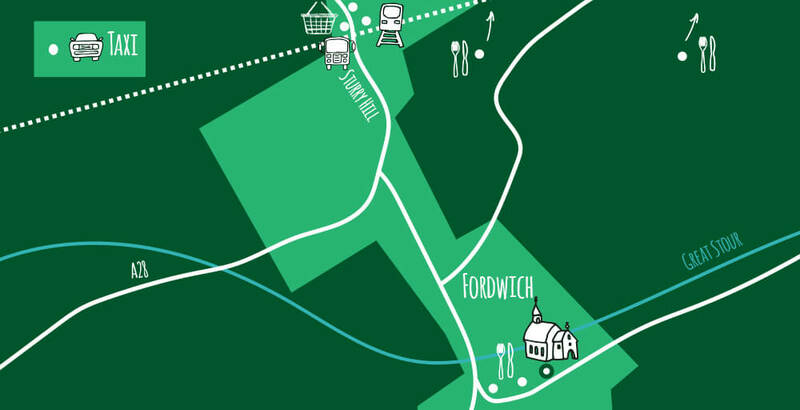 The Goods Shed – Station Road West, Canterbury, CT28AN, Ph 01227 459153 – Large farmers Market & Restaurant (3.2 miles from church). Cheesemakers of Canterbury – Lamberhurst Farm, Dargate, Faversham, ME13 9ES, Ph 01227 751741 – Artisanal cheese makers using local dairy products (13.2 miles from church). Canterbury Cathedral –Cathedral House, 11 The Precincts, Canterbury CT1 2EH – Mother church of the Anglican faith and site of the martyrdom of St Thomas Becket (3.2 miles from church). Click here for more information. 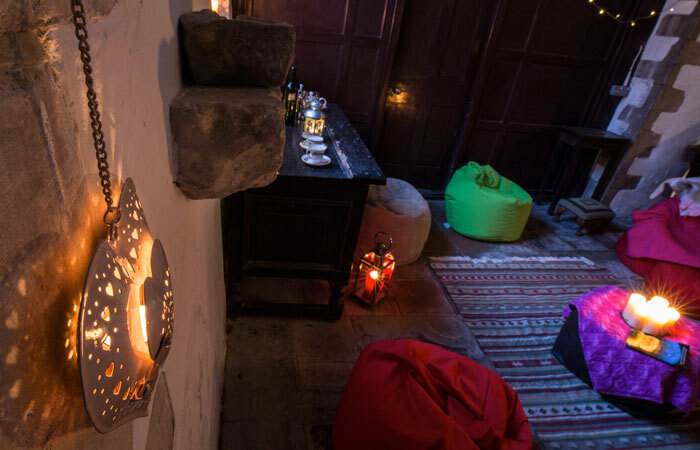 Eastbridge Pilgrim Hospital – 25 High St, Canterbury CT1 2BD – Well-preserved medieval pilgrim hostel with 14th century wallpaintings and a crypt (3.6 miles from church). Click here for more information. Canterbury Heritage Museum –Stour St, Canterbury CT1 2NR – Excellent museum charting the unique history of the Canterbury area (3.5 miles from church). Click here for more information. I first read about the experience in Kent Life and decided that it would make a good birthday present for my niece, her father and myself. (Better than a Bluewater voucher!) I managed to keep it a secret and told them they would be going for a night away. We parked next door in the Fordwich Arms car park which where we later had dinner booked. As we wandered down the path to the church entrance, my brother exclaimed that he didn’t believe we were going to stay in a church. As we entered and put your Champing notice up we took stock of our surroundings. 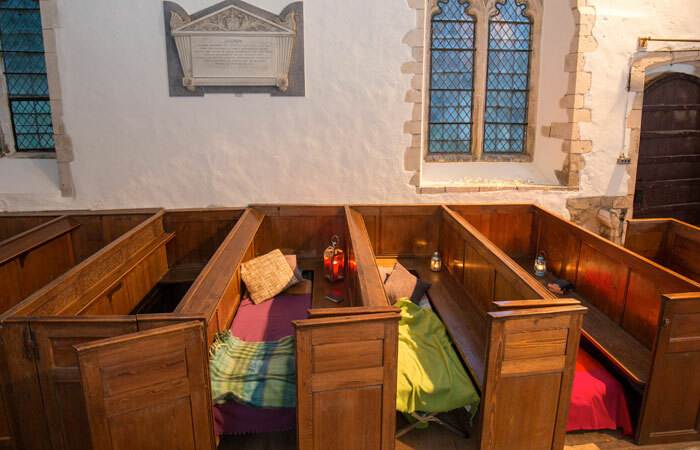 What a fantastic set up, apart from the magnificence of the church itself, the way you provided easy chairs around a table with all the necessary items for drinks, tea and coffee etc and our beds laid out in the cubicles between the pews made us really feel part of the fabric. The toilet facilities were top-tastic, 10/10. Time to explore…. We had a small picnic with a few nibbles we brought along, some beers and soft drinks opened and we set about exploring our new environment. How much fun it was to sit at the church organ pretending to play (good job it was not working otherwise the local neighbours may have got an impromptu recital). We each took turns preaching from the pulpit, I read from the book of proverbs! We all felt like the vicar of Dibley even though our congregation was only two. We explored the grave yard, river frontage and enjoyed checking on the local social history. We enjoyed a pub meal and a game of cards before returning to the church for a night-cap and bed. Once ensconced in our comfy sleeping bags it was time for some more fun. I had turned off all the lights so the church was pitch black. Lying in bed with my powerful torch I shone it on the back of my hand projecting a giant claw like shadow off the vaulted ceiling which descended on my brother and niece. She roared with laughter and he told me to behave and stop scaring them. We all slept like logs. A cup of tea in the morning and a “hello” to an early morning visitor who was keen to photograph the church, surprised that we had spent the night there. We signed the visitors book to say what a thoroughly great experience we had enjoyed, before heading off to Canterbury and The Goods Shed for breakfast, otherwise we may have tried out one of your hampers. Well done to you all, especially the locals who made our visit so comfortable. I will definitely be trying out another church with my wife next time somewhere different. I would definitely recommend the experience to anyone interested in churches, surprises, making scary shadows, unusual birthday presents and amateur preaching. Had the most wonderful experience of champing in the lovely church at fordwich. We are both looking forward to repeating this experience with family and friends. A little apprehension in our group of six, but we really needn’t have worried. a great night was had by all. A tad cold and only four wine glasses but mugs sufficed! Cosy sitting around with the lanterns and candles and in the morning we really appreciated a lovely cup of tea. Fordwich is a very pretty town and the locals are lovely, we had a super welcome in the pub next door and Sunday lunch there was amazing. All in all a great experience, one we all felt was well worth ‘ticking’ off the list. 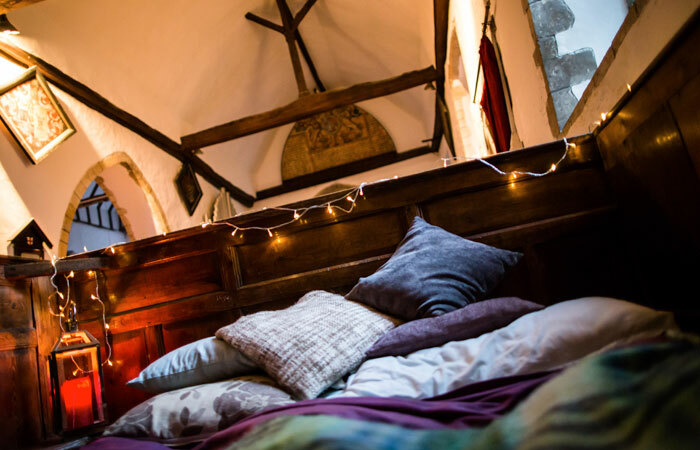 I was immediately excited about the idea of champing when I’d heard of it months ago, although my husband was really skeptical about spending the night in an old church – but even he completely warmed to the idea when we got to St Mary the Virgin! 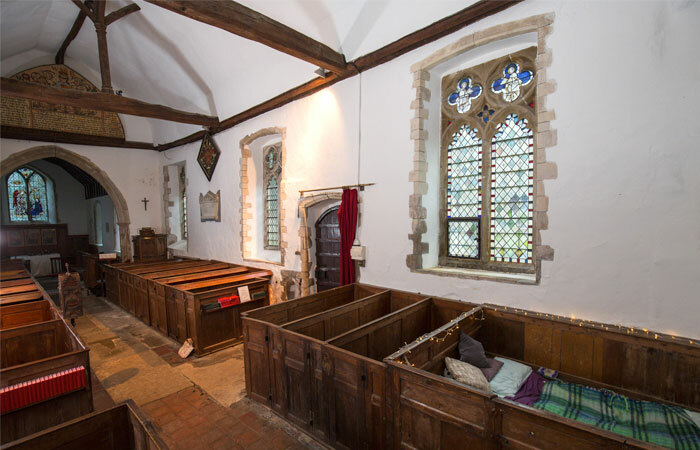 Two camp beds had been set up in a pew box, complete with twinkle lights and electric candles. Once we’d laid out our comforter and some pillows, it was quite home-y. The organizers thoughtfully provided a lot of comforts, like camp chairs, throw blankets, fresh water, a table, lanterns, tea things, a dish washing area, board games, and a helpful sign to hang on the gate informing potential visitors that the church was currently in use while we were there. The bottle of wine I’d ordered was chilling in a bucket, and the bathroom was clean and worked perfectly. I loved the spooky atmosphere, exploring the graveyard, and reading the inscriptions on the tombs, and the booklet of information about the church’s history and architecture was great. Good location, very close to Canterbury and about ~40 minutes’ drive from the coast by Dover. We spent the night in late May, and it was a little chilly, but nothing that a throw blanket or a comforter couldn’t easily keep out. Stayed at St Mary’s in Fordwich on Tuesday – it was amazing. Certainly one of the more unusual places we have slept in! Had a delicious evening mesl in Fordwich Arms – Thoroughly recommended. All very well organised. We will certainly ‘champ’ again next year! The most memorable B&B we have ever stayed in. Makes your average hotel room or B&B seem very dull. What an amazing experience! Lazy evenings spent exploring the church, pub dinners, such quiet nights sleep, waking to birdsong and dappled light through stained glass. Wonderful stay! Thank you CCT for letting us stay! Beautiful – Just a wonder to open your eyes in the morning. Thank you! !